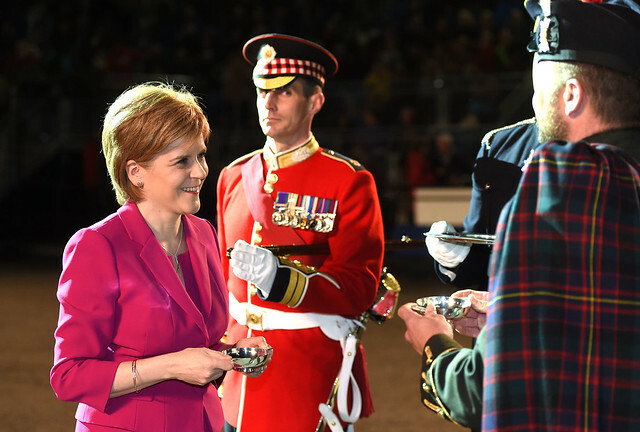 First Minister Nicola Sturgeon was welcomed at Saturday’s (August 15) late performance of The Royal Edinburgh Military Tattoo (until August 29, 2015). She acknowledged the Gaelic Toast of Lone Piper Sergeant Colin Simpson, from The Highlanders, 4th Battalion, The Royal Regiment of Scotland, with Garrison Sergeant Major and Tattoo Regimental Sergeant Major John Ford, Scots Guards. 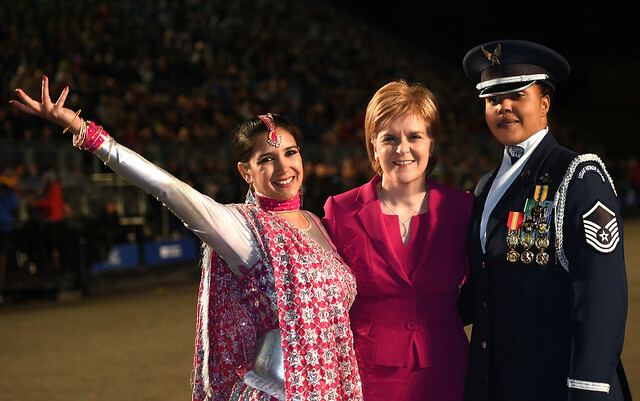 Before the performance she was met by Bollywood dancer, Rea Krishnatraye, and Master Sergeant Tamekia Woods from the United States Air Force Honour Guard. They were flown in from New Delhi and Washington DC respectively for the 66th military showpiece event and are starring at the Tattoo’s critically-acclaimed ‘East Meets West’ performance on the Castle Esplanade. The Royal Edinburgh Military Tattoo is a not-for-profit organisation, which in recent years has gifted some £8 million in surplus funds to charitable arts and service benevolent organisations. Some of the charities who benefit from the Tattoo’s annual activities include ABF The Soldiers’ Charity (formerly known as the Army Benevolent Fund), Seafarers UK, the RAF Benevolent Fund and the Edinburgh International Festival.